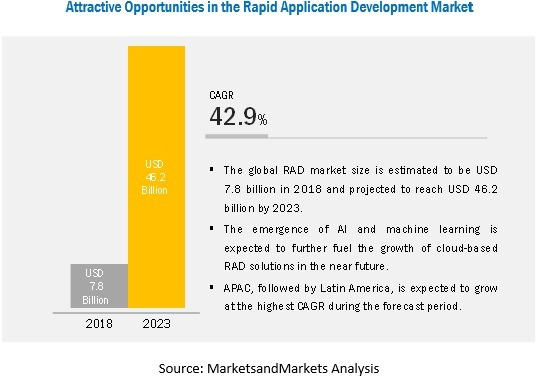 [137 Pages Report] The rapid application development market size is expected to grow from USD 7.8 billion in 2018 to USD 46.2 billion by 2023, at a Compound Annual Growth Rate (CAGR) of 42.9% during the forecast period. The demand for faster software programming is expected to rise over the next 5 years owing to various factors, including need for customized and scalable software. The need for business varies with the total number of workforce and the nature of business. The companies at times to cater their customers’ needs rapid delivery and deployment of business related application, the customized apps help in saving time with maximum business orientation. These platforms help developers create customized applications without coding or with minimum hand coding, which help in expediting a high-quality software development process when compared to the traditional Software Development Life Cycle (SDLC). The rise in digital transformation has led organizations to meet the need of clients instantly. The RAD environment enables a technical as well as a non-technical user to develop a customized software application using RAD’s unique underlying characteristics. This is one of the major factors leading to the growing adoption of RAD tools. With RAD tools, an organization can build any application faster, thereby eliminating the time taken for vendor-supplied customization. Another factor accelerating the RAD market is the minimal training to non-developers to enable them to learn more about the software development process. The SMEs are mainly adopting RAD platforms to develop business applications and improve their productivity rapidly. One of the prime motives of the SMEs is to develop customer-centric applications at lower costs. Moreover, the SMEs are looking for cloud-based RAD platforms to save money, time, and resources. Another reason for the SMEs to prefer cloud-based solutions is their financial constraints. Such features are compelling the SMEs to adopt cloud-based RAD platforms, which is expected to be driving the overall growth of the RAD market. The demand for the cloud-based deployment model is expected to be increasing rapidly. These days, more applications are being deployed over the cloud, and the large enterprises and SMEs have been making a shift from the traditional on-premises deployment model to the cloud-based deployment model. SMEs, in particular, implement RAD platforms using the cloud deployment model, as it enables them to focus on their core competencies rather than investing more capital on their IT infrastructure. 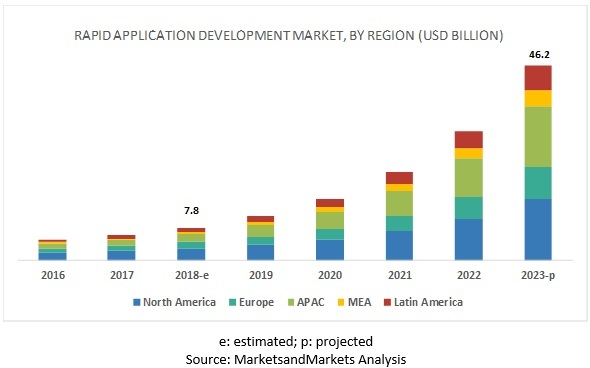 The global rapid application development market by region covers 5 major geographic regions: North America, Asia Pacific (APAC), Europe, the Middle East and Africa (MEA), and Latin America. North America constitutes the highest market share, owing to the early adoption of rapid application development, as well as prominent initiatives taken by the industry players in the form of partnerships with different technology players in the region. The US and Canada are 2 two prominent markets in North America that are witnessing healthy adoption of advanced technologies, such as cloud data warehouse solutions. The rapid application development market comprises major providers, such as IBM (US), AWS (US), Google (US), Microsoft (US), Oracle (US), Salesforce (US), Appian (US), Mendix (US), Zoho Corporation (India), OutSystems (US), LANSA (US), Ninox (US), Oro (US), Matsoft (UK), Kony (US), Pegasystems (US), ServiceNow (US), WaveMaker (US), KiSSFLOW (India), Radzen (Europe), AmpleLogic (India), FileMaker (US), QuickBase (US), AppSheet (US), and K2 (South Africa). The study includes in-depth competitive analysis of these key players in the global market with their company profiles, recent developments, and key market strategies. In April 2018, Microsoft partnered with C3 IoT, an AI and IoT software platform provider, to deliver new technology developments and provide go-to-market strategies that accelerate enterprise AI and IoT application developments. Combining the market reach of Microsoft Azure and the capability of C3 IoT’s AI platform, Microsoft plans to accelerate the adoption of AI, IoT, and elastic cloud computing globally. In November 2018, AWS upgraded the capabilities of AWS Lambda by adding two new features, including Lambda Runtime API and Lambda Layers. These features would enhance the productivity of developers by helping them build custom runtimes, and enable them to share one code across different functions. In January 2018, Zoho Corporation launched two products: Zoho PageSense, a website optimization software that helps marketers expand conversion rates through visualizing, testing, and measuring behavior patterns, and Zoho Flow, a drag-and-drop integration platform that assists users in creating flexible workflows between cloud applications. In July 2018, OutSystems launched OutSystems Insights, its first app intelligence solutions for the low-code development platform. OutSystems Insights is focused on helping organizations that need support for continuous improvement and prioritizing current and future application development. What are the opportunities in the RAD market? What is the competitive landscape in the RAD market? What are the regulations that will impact the RAD market? What are the dynamics of the RAD market? *Details on Business Overview, Products/Tools/Solutions/ Platforms Offered, Recent Developments, SWOT Analysis, and MnM View Might Not Be Captured in Case of Unlisted Companies. The study involved 4 major activities to estimate the current market size for the rapid application development market. An exhaustive secondary research was done to collect information on the market, the peer market, and the parent market. The next step was to validate these findings, assumptions, and sizing with industry experts across the value chain through primary research. Both top-down and bottom-up approaches were employed to estimate the complete market size. Thereafter, the market breakdown and data triangulation procedures were used to estimate the market size of the segments and subsegments. In the secondary research process, various secondary sources, such as Hoovers, Bloomberg Businessweek, and Dun & Bradstreet, have been referred to identify and collect information for this study. These secondary sources included annual reports; press releases and investor presentations of companies; whitepapers, certified publications and articles by recognized authors; gold standard and silver standard websites; rapid application development technology Research and Development (R&D) organizations; regulatory bodies; and databases. 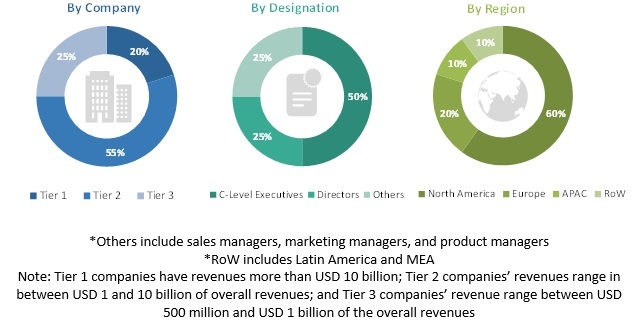 Various primary sources from both supply and demand sides of the rapid application development market ecosystem were interviewed to obtain qualitative and quantitative information for this study. The primary sources from the supply-side included industry experts, such as Chief Executive Officers (CEOs), Vice Presidents (VPs), marketing directors, technology and innovation directors, and related key executives from various vendors who provide the rapid application development software, associated service providers, and system integrators operating in the targeted regions. All possible parameters that affect the market covered in this research study have been accounted for, viewed in extensive detail, verified through primary research, and analyzed to get the final quantitative and qualitative data. IBM (US), AWS (US), Google (US), Microsoft (US), Oracle (US), Salesforce (US), Appian (US), Mendix (US), Zoho Corporation (India), OutSystems (US), LANSA (US), Ninox (US), Oro (US), Matsoft (UK), Kony (US), Pegasystems (US), ServiceNow (US), WaveMaker (US), KiSSFLOW (India), Radzen (Europe), AmpleLogic (India), FileMaker (US), QuickBase (US), AppSheet (US), and K2 (South Africa). This research report categorizes the rapid application development market based on type, component, business functions, deployment model, organization size, industry vertical, and region.